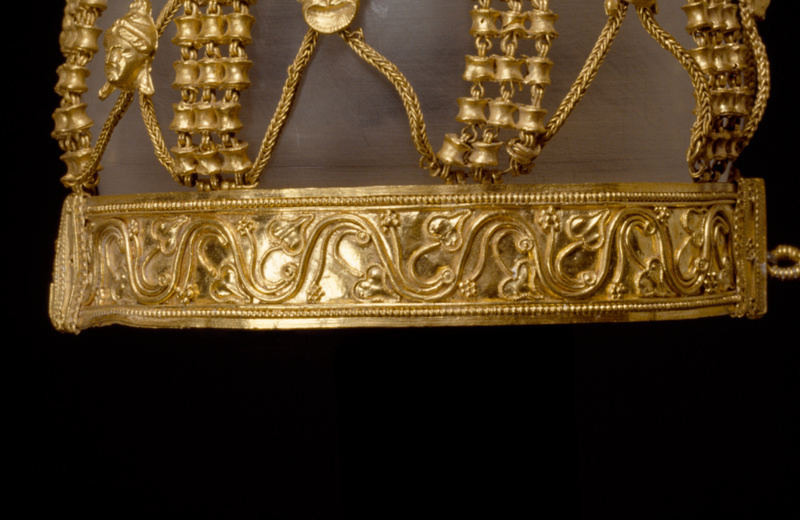 Very few gold hairnets have survived from antiquity. 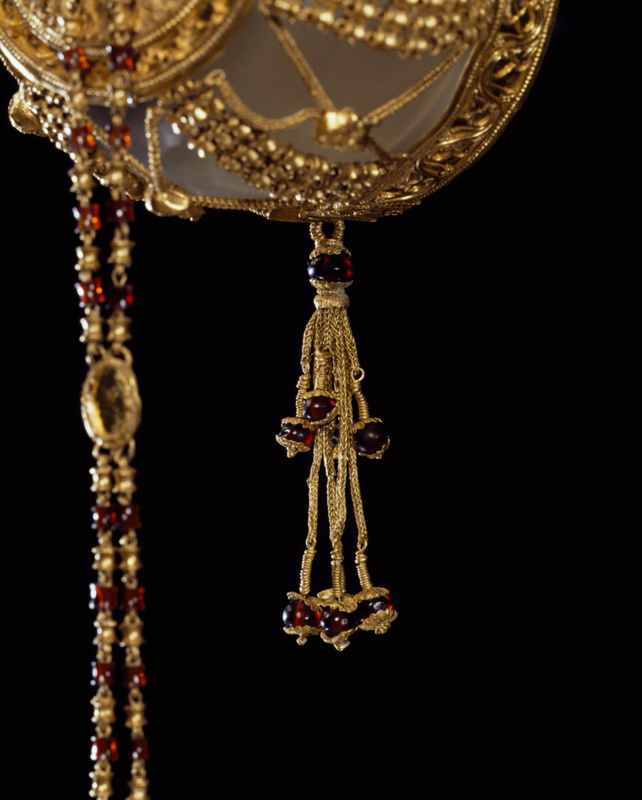 This example, made to be worn over a bun at the back of a head, is remarkable for the quality and degree of its elaboration. The hairnet consists of four elements: the medallion, the tassels and chains, the net, and the circular base. 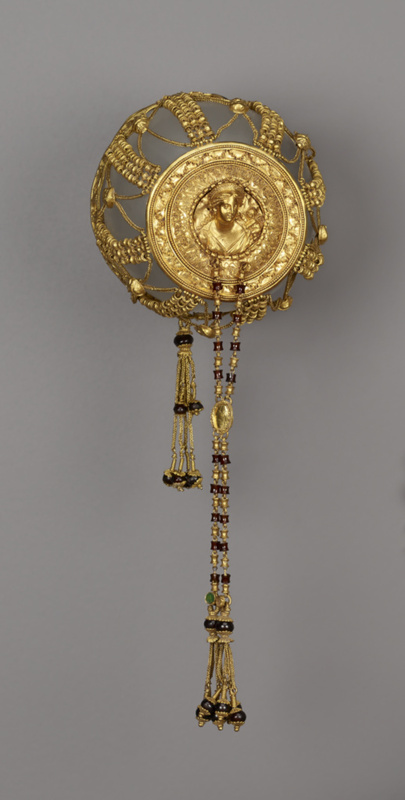 The medallion bears a bust of Aphrodite, the goddess of love, accompanied by her son Eros and surrounded by bands of filigree. Tassels on long chains hang from the medallion and clasp. 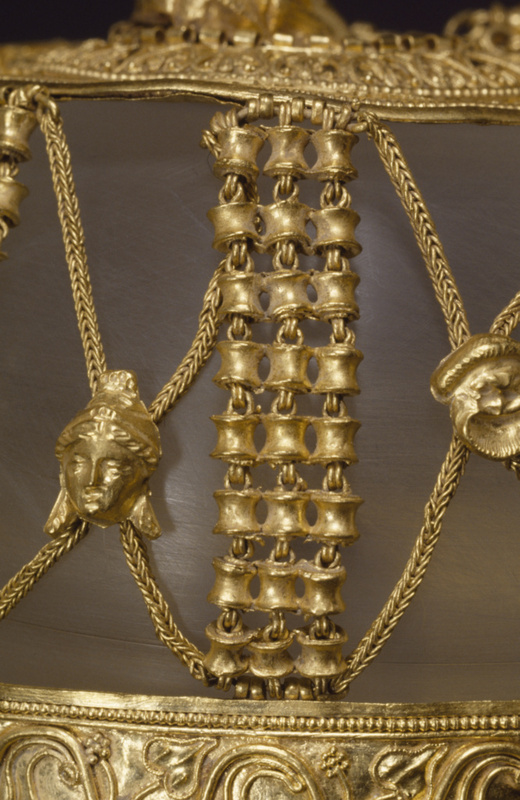 The net itself consists of bands of gold chains sheathed in gold spool beads, a typical Hellenistic design, linked by crossed chains decorated with Dionysiac masks. 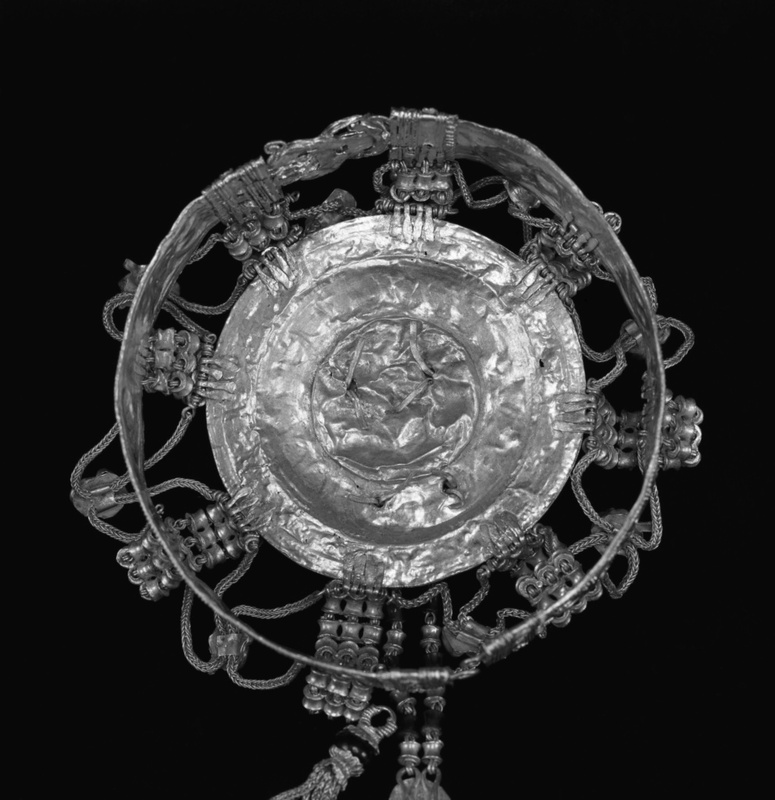 The circular base is embellished with a large Herakles knot, floral tendrils, ivy leaves, and berries. 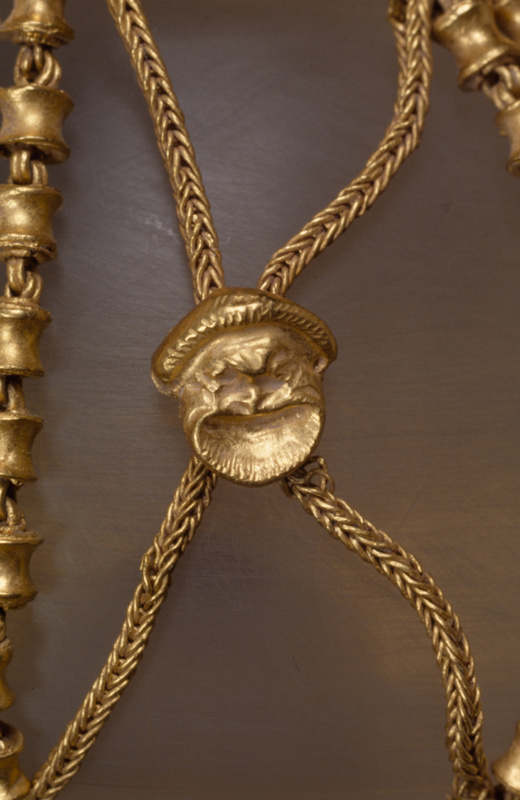 Certain elements of the hairnet's decoration seem to have had a close connection to the Ptolemies, the ruling family of Hellenistic Egypt. 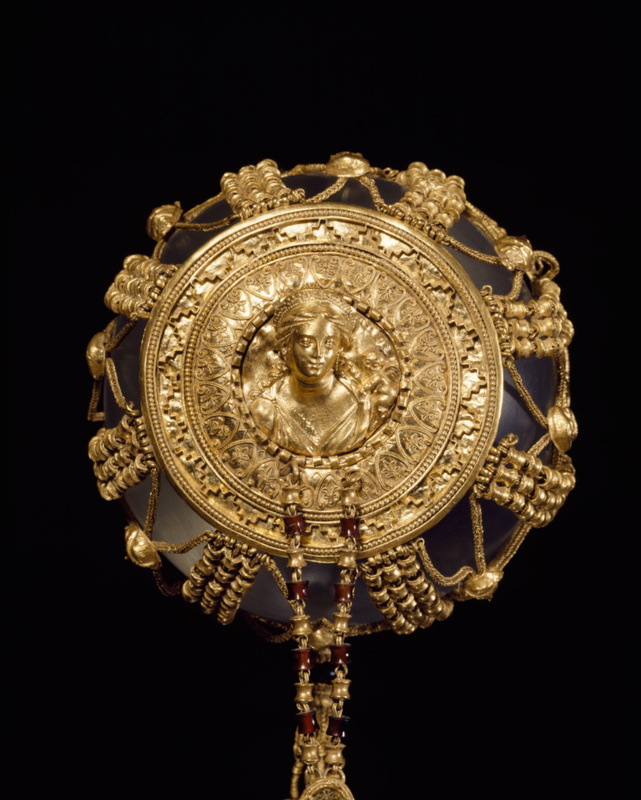 Aphrodite was considered the divine equivalent of many Ptolemaic queens, and the woman on this hairnet bears a resemblance to portraits of Queen Arsinoe III. The Ptolemies also considered Dionysos and Herakles to be their divine ancestors. 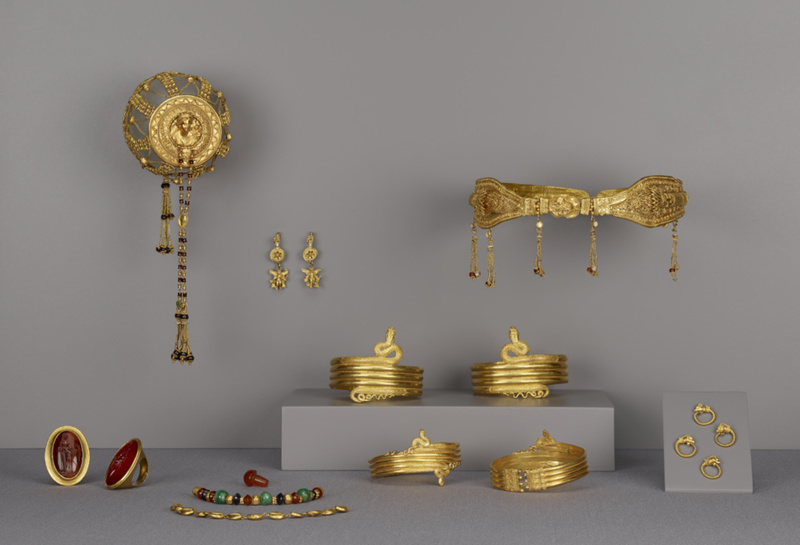 Although such associations do not necessarily mean that this jewelry was made for the royal family, they point to Ptolemaic Egypt as the hairnet's country of origin. Robin Symes (London, England), sold to Barbara and Lawrence Fleischman, 1990. Barbara Fleischman and Lawrence Fleischman, American, 1925 - 1997 (New York, New York), sold to the J. Paul Getty Museum, 1992. "La Chronique des Arts: Principales Acquisitions des Musée en 1992." Gazette des Beaux-Arts 121, ser. 6 (March 1993), p. 39, cat. no. 190. The J. Paul Getty Museum Handbook of the Collections. 4th ed. (Los Angeles: J. Paul Getty Museum, 1997), pp. 56-57. Towne Markus, Elana. 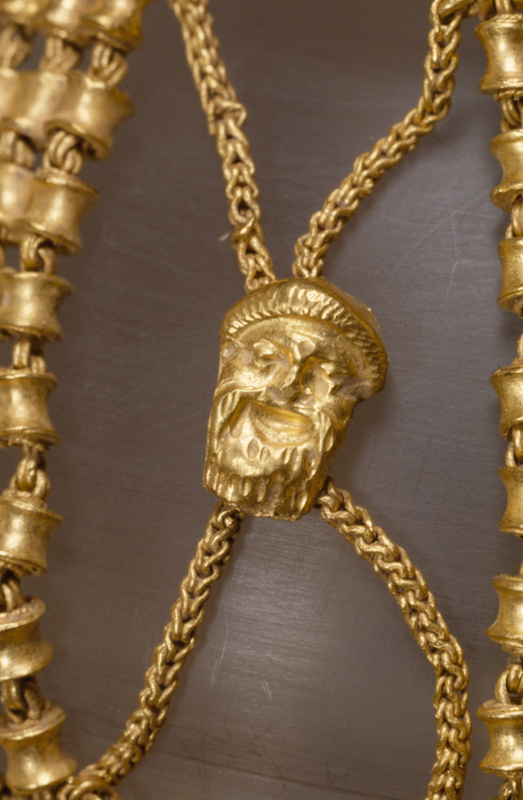 Masterpieces of the J. Paul Getty Museum: Antiquities. (Los Angeles: J. Paul Getty Museum, 1997), pp. 58, 64. Pfrommer, Michael. Alexandria: Im Schatten der Pyramiden (Mainz: P. von Zabern, 1999), figs. 174a-c.
Pfrommer, Michael. 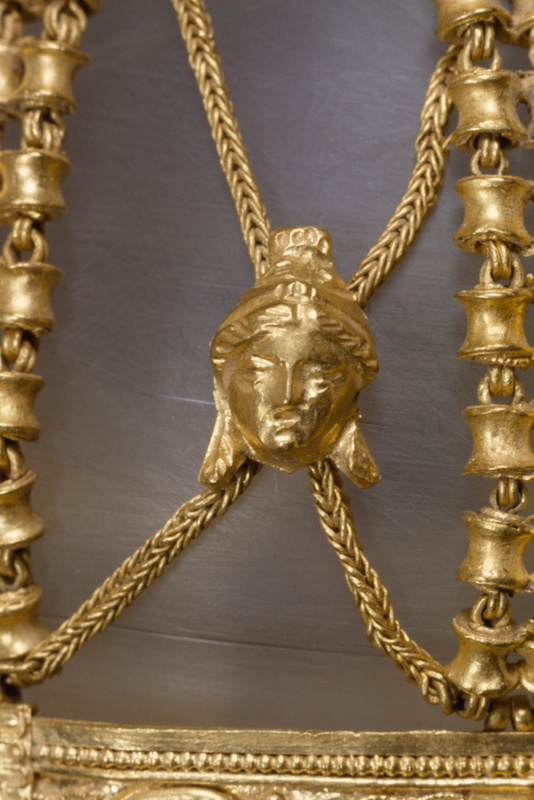 "Hellenistisches Gold und ptolemaeische Herrscher." In Studia Varia from the J. Paul Getty Museum 2. Occasional Papers on Antiquities 10 (2001), pp. 79-114, figs. 15a-g. The J. Paul Getty Museum Handbook of the Collections. 6th ed. (Los Angeles: J. Paul Getty Museum, 2001), pp. 56-57. Pfrommer, Michael, with E. Towne Markus. 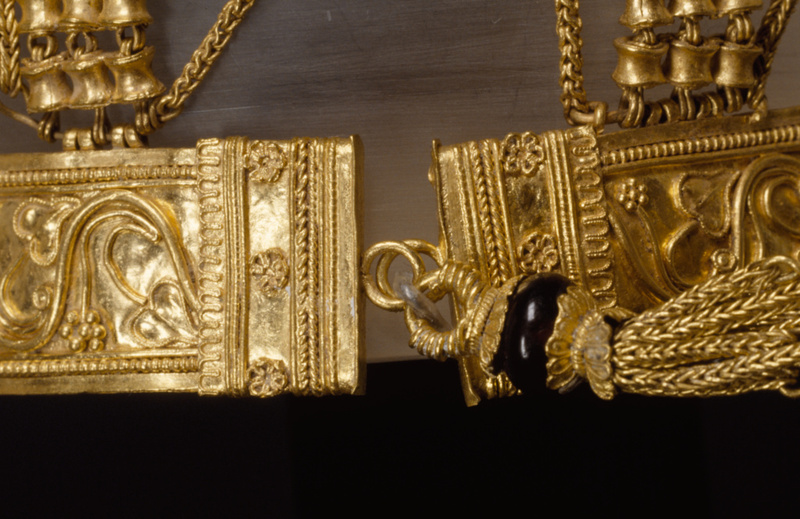 Greek Gold from Hellenistic Egypt. Getty Museum Studies on Art (Los Angeles: J. Paul Getty Museum, 2001). The J. Paul Getty Museum Handbook of the Antiquities Collection (Los Angeles: 2002), pp. 92-93. Pfrommer, Michael. Könignnen Vom Nil (Mainz am Rhein: von Zabern, 2002), p. 108, abb. 93-94. Spivey, Nigel and Squire, Michael. Panorama of the Classical World (Los Angeles: Getty Publications, 2004), pp. 24-25, fig. 30. Sacks, David. Encyclopedia of the Ancient Greek World (New York: Facts on File, 2005), p. 138, ill.
Jackson, Monica M. Hellenistic Gold Eros Jewellery: Technique, Style and Chronology (Oxford: Archaeopress/BAR International Series, 2006), p. 126. Lapatin, Kenneth. 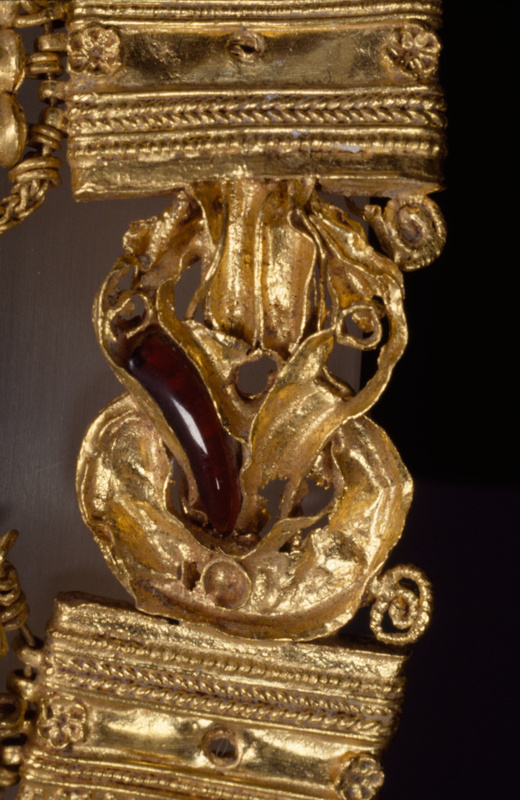 Luxus: The Sumptuous Arts of Greece and Rome (Los Angeles: J. Paul Getty Museum, 2015), pp. 75, 232, pl. 40. Picon, Carlos, and Sean Hemmingway, eds. Pergamon and the Hellenistic Kingdoms of the Ancient World (New Haven and London: Yale University Press, 2016), pp. 225-226, no. 159a, ill., entry by Mary Louise Hart.